Water, it’s everywhere – we need it more than food to survive, so why does it cause so much debate? Let’s take a look at our drinking water in all its forms and try and debunk some of the crazy chat about it. What is water and why do I need it? 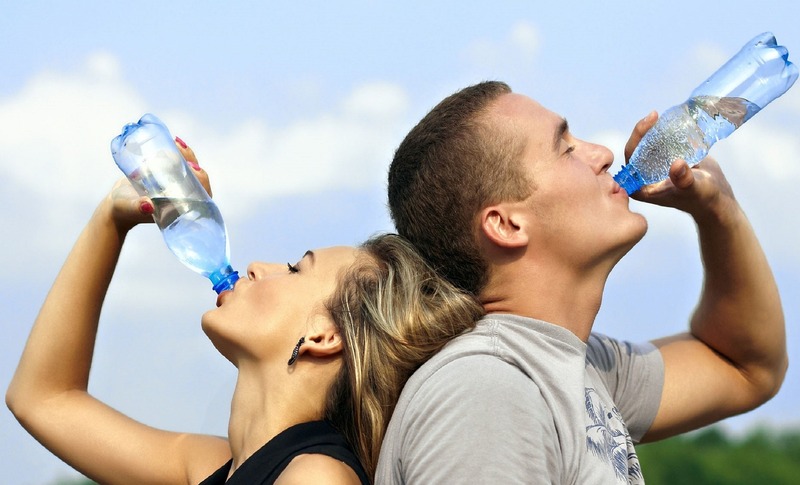 Around 60% of our body mass is water, and muscular men will have the highest percentage of body water. Water is everywhere, it’s probably the most ubiquitous substance we come in contact with. It’s simply two atoms of hydrogen and one of oxygen – H20. At room temperature, it’s a liquid state, at 0c or lower, it’s solid (ice) and turns to vapour as it heats. Every cell in your body relies on water, in fact – about 60% of your whole body mass is water! Although this varies by gender, age and your fat/muscle ratio. We’re also constantly losing water through breathing (just breathe onto a mirror and you’ll see what I mean! ), going to the toilet, and sweating. Athletes and people who live in hot countries will lose more water than sedentary people living in cooler countries. So water needs to be replenished, constantly – not all in one go, throughout the day in small amounts. Just like food! You don’t eat all your daily calories in one sitting (well you might, but that’s another article!) and so you should also pace your drinking out too. In fact, very little that happens in our body doesn’t require water to function properly. We’ve all felt thirst at one time or another, but what is it and how does that work? Our brains are able to keep tabs on the saltiness of our blood, and regulate our internal hydration accordingly. This is possibly why eating salty foods, such as crisps or take-out food can make us really thirsty – they tend to be high in salt. If we are dehydrated and haven’t drunk any liquid for a while, the brain tells our kidneys to reduce the amount of water that is excreted, and thus making our urine much darker in colour. If we’re very dehydrated, we’re inclined to gulp down water quickly and by large volumes – and sometimes this can immediately affect how thirsty we feel. How can our brain know so quickly? It seems to monitor many aspects of our water intake – including how we swallow! Once we’re satisfied, we stop drinking – and if we don’t, we tend to find drinking more than we need really unpleasant. Some studies suggest that swallowing water creates different actions in the gullet than swallowing food, and our brain is able to detect the difference. 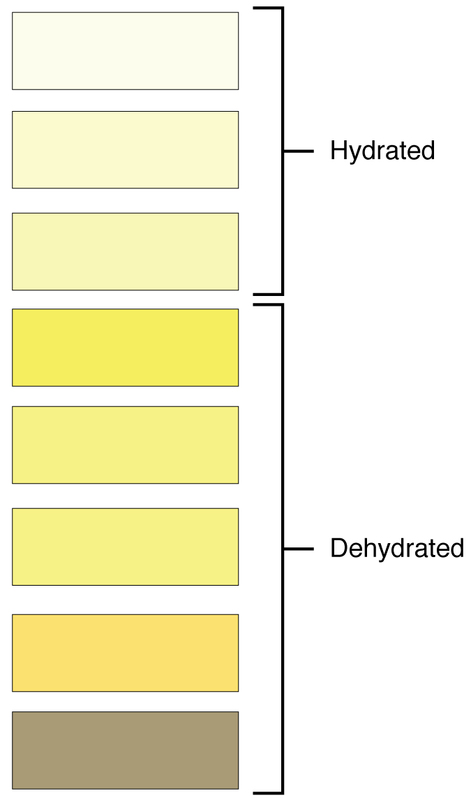 Nature has given us a simple way of testing how hydrated we are – the colour of our urine. You’ve probably heard that you need 8 glasses of water a day to stay hydrated. I know I certainly had before I knew anything at all about how the human body worked. The problem with this is two-fold – how much is a glass? It’s a little subjective isn’t it? Secondly, if I’m 188cm tall and weigh 90kg, and my friend is 150cm tall and weighs 60kg, do we both need the same amount of water? How much water you need to drink on a daily basis depends upon how big you are, whether you live in a hot climate, your age, how much you sweat among other things too. Almost all nutrition guidelines are population-based, and don’t account for individual variations. So it’s a practicality issue, guidelines can only give advice based on a mythical average person. It’s impossible to cater for everyone. But to answer the question, how much is a glass – it’s simply 2L divided by 8, or 250ml. We roughly need around 2L water daily, but this could be more or less depending on you and your circumstances. Thankfully, nature has given us a much simpler test to determine whether we’ve drunk enough water – it’s simply the colour of our urine. And we all go to the toilet! It’s much easier than calculating exact amounts, or even stressing about whether we’ve had 8 glasses or not. Apart from the first passage of urine of the day (usually after waking in the morning), your urine should be a light straw-colour. And gets lighter after each toilet visit right throughout the day. So if your urine is a very light colour, or even practically clear (and it can be, mine often is!) – then you’re hydrated! It’s really that simple. If it’s dark, go to the tap, and have a drink! OK, water isn’t the only source of fluid – most of us drink other things such as tea, coffee, fruit juice, cans of fizzy beverages among others. And this is forgetting that water also passes into our system through the food we eat (albeit not in huge quantities!). 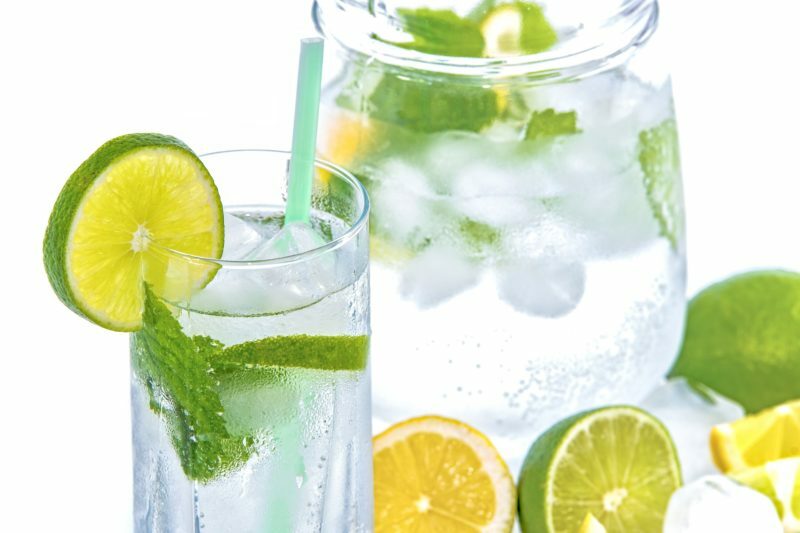 Water is best, next is teas or anything without sugar or sugar substitutes (including fruit juices) – but if we’re talking hydration, anything except alcohol. But sticking to water, is all water equal? Are there better forms of water? Should you be drinking water in its raw state? Or bottled? Is tap water OK…? Raw water is trending – and becoming particularly popular in the US. It’s thought that drinking and eating anything and everything natural is more healthy. The new kid on the block is raw water! I know, don’t look at me like that – how can water not be raw? It simply refers to water that is unprocessed in anyway, which is essentially what raw means – unprocessed. When you turn on your tap, the water comes from a processing plant. It’s been treated and filtered to get rid of bacteria, detritus, parasites and anything else that might interfere with our health. Water you buy in bottles is no different. Just because it states it’s spring water on the label, don’t for a minute think it comes straight from a spring, into a bottle and then into your gym bag! It’s processed first. Well that’s exactly what raw water is – water taken straight from fresh water springs or rivers and bottled – bugs, animal urine and faeces etc. with it – does that really sound healthy to you? Other animals might drink it, and our ancestors would have done too – and had issues with cholera and other water-born nasties. Moreover, they often fermented their water and drank that instead as it was safer – it’s called beer. Given the choice, would I personally drink a bottle of raw water, or take a glass and scoop out water from my toilet bowl and drink it? The latter – because my loo is spotlessly clean and the water that flushes it is the same water I fill the kettle with*. *Please note: in some British households, your bathroom water comes from a tank in your roof – not sure I’d drink that! 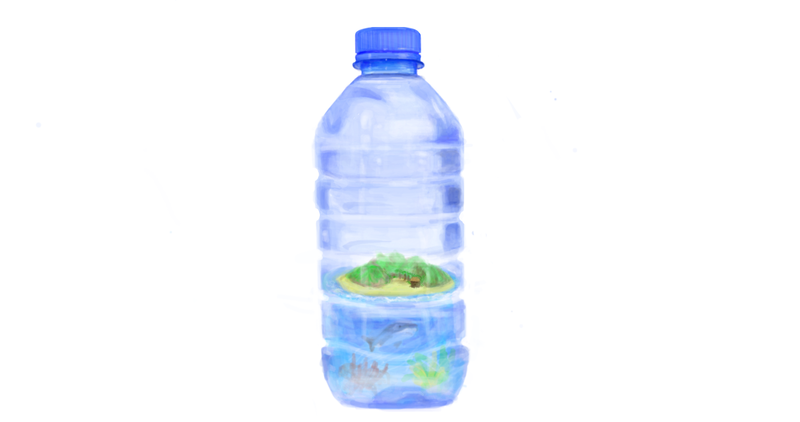 Apart from driving the need for plastic and thus increasingly polluting the British countryside and the waters around it, what is bottled water good for? Health, there is no evidence at all that bottled water is healthier than tap. This is an old study now, but does show that in the past bottled water has come out worst than tap water in tests. There have been a number of blind taste tests done to prove whether bottle water really does taste better than tap. Neither came out better – most people cannot tell the difference. If you really don’t trust tap water and prefer bottled water, then why not invest in a good water filter? It’ll be much cheaper in the long run. 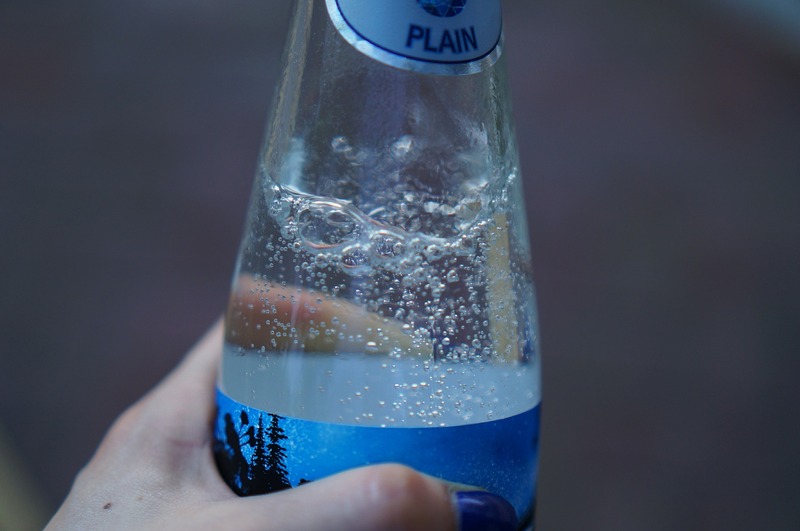 It’s long been believed that drinking fizzy or sparkling water acts as an appetite suppressant, because the bubbles expand the stomach, tricking you into thinking you are full. A recent study suggested that drinking fizzy water actually did the very opposite because the carbon dioxide in fizzy water created a hormone response that actually makes us feel hungry. 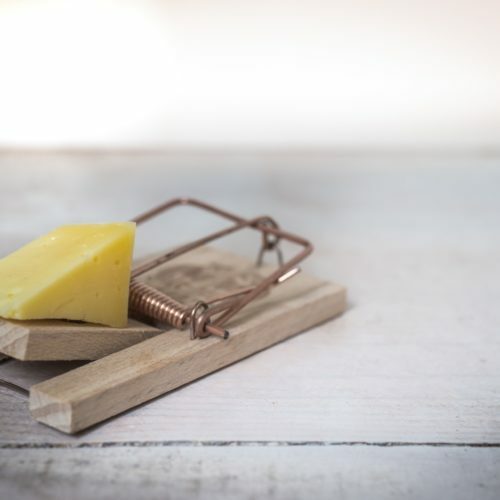 This study created a number of headlines in 2017, which later had health experts trying to calm things down a little by saying, wait – this study was done on rats, we cannot conclude that the same thing happens in humans. However, a small but interesting study was conducted by the BBC’s Trust Me I’m a Doctor team, and they found that indeed, this effect found in rats can also be found in humans. Drinking fizzy water may well make you eat more food. Water usually has a neutral pH (neither acid nor alkaline, or will be mildly one way or the other). Alkaline water has been treated to increase the pH (a scale that measures how acid or alkaline something is) by using an ioniser to remove the acidic particles (usually carbon dioxide). In the UK, if you live in an area with hard water, your water is already alkaline. However, the trend for alkaline water emerged from the popularity of the alkaline diet, where it is believed that eating or drinking certain foods can affect the body’s pH and thus have deleterious effects on health. Not to mention its magical ability to cure or prevent the development of a range of diseases. Studies supporting the health benefits of alkaline water are few and far between, many are small or on animals only. A systematic review conducted in 2016 found no benefits for the prevention of cancer or alteration to acid load. It may however perform better than standard water for blood viscosity during strenuous exercise, which allowed the blood to flow more efficiently allowing for a quicker recovery post exercise. There are some cautions with alkaline water however. Stomach acid could be neutralised by it, which is fine if you suffer hyperacidity (excess acid), otherwise it can prevent proper digestion and breakdown of food before it enters the lower digestive tract. There’s nothing intrinsically wrong with alkaline water, it’s just that there is really no scientific evidence to back up these amazing claims! All the evidence comes down to one simple fact – we all need to drink water, and we all need to drink it everyday. For most of us, drinking it straight from the tap is by far the best way whichever argument you look at. You might just want to purchase a water filter, but even that isn’t completely necessary. Do yourself, your pocket and the planet a favour, and buy a reusable, washable water bottle and fill it straight from the kitchen tap.